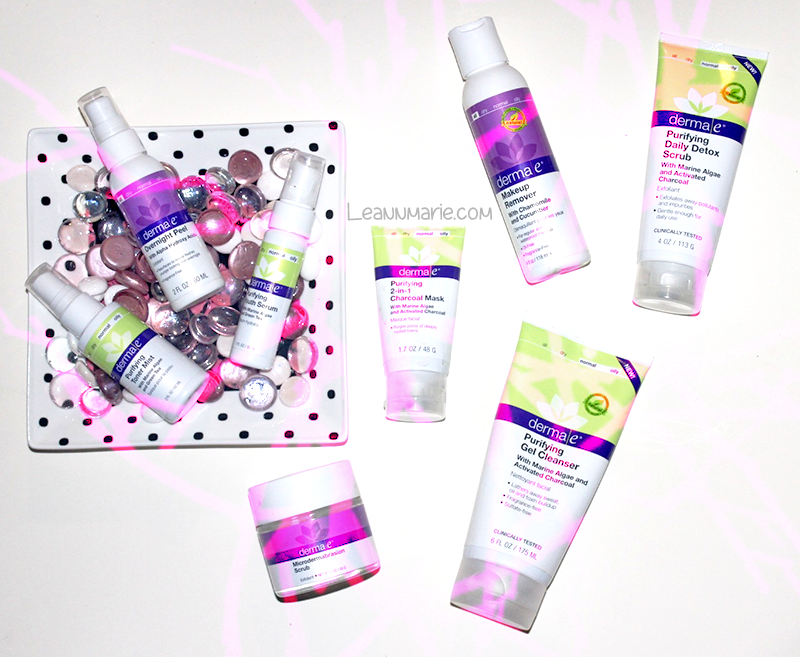 Welcome back to my blog, in today's post I'm going to be sharing with you my thoughts on Derma E. Derma E is a natural skin care brand that has a variety of products to meet different needs, all infused with different vitamins and minerals to really nourish your face in a healthy way. 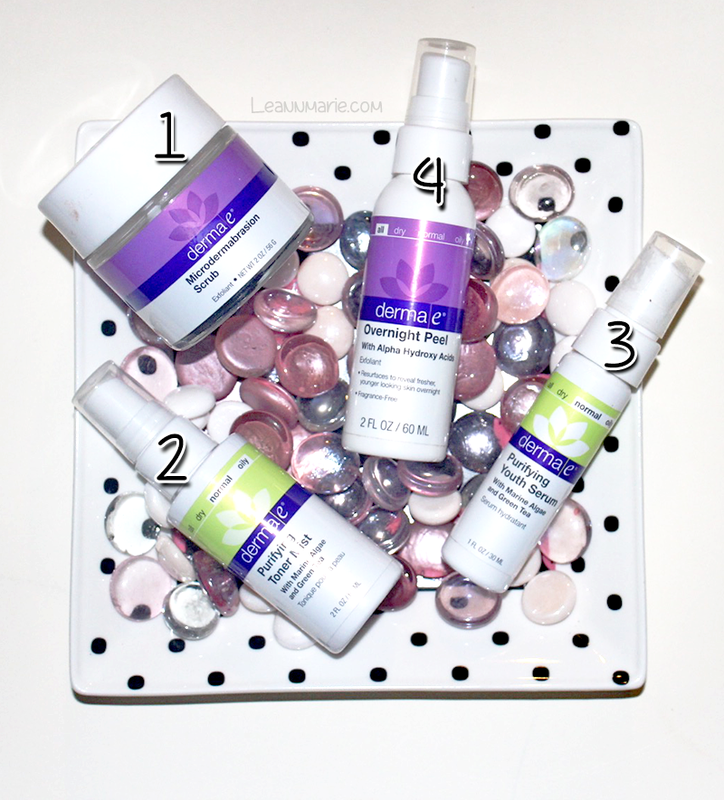 Derma E was kind enough to send me some products to try out and review. Some products I did own and already tried through Ipsy and Generation Beauty. As with all my reviews, they are completely my opinion, truthfully. I also make sure to test my products out (depending on what kind it is) so I can tell you the truth benefits and cons of using the product. I've tested out Derma E for a little over a month after switching up my skin care routine and implementing Derma E into my routine. The added plus, Derma E is vegan and cruelty free! This review may be pretty long, so make sure you grab a snack and drink and get ready!! At first when I got this scrub, I don't know but I thought it was for your body. Silly, silly me haha. But when I finally used it on my face. My oh my! Since my skin is sensitive, I used a softer touch to my skin when I was rubbing it in circular motions. I really like how the scrub is more fine in texture than other scrub. Instead of being bigger chunks, it was actually smaller particles that really got into my skin and into my pores to fully cleanse my skin. What I also love about this product, is that the first ingredient is water. Meaning that the scrub is mainly made up of water which is a good thing for your skin. It has dead sea salt and volcanic sand plus grape seed and Vitamin E to really combat the cells of your skin to purify it. Even though its not really meant for your body, you can use it on your hands, heels, elbows and knees to create a softer skin texture. This product can also help to diminish fine lines and wrinkles. This was a product that I got from Generation Beauty last year and I tried it a few times, but that was back when I didn't really have a skin care routine. I was just learning more about the importance of a skin care routine and I was slowly building up a variety of products to see what skin care combination worked well for me. Since I received this product, I decided to swap out my old toner and I started to use this one. What I really liked about this toner was that I was able to use it without it having a tingling sensation on my skin. When I use other toners, they usually leave a sticky feeling to my face or they give me a slight burning sensation, nothing harse. However, when I used this toner, my skin really soaked it in well and it left my face feeling a little more firm. I just had to make sure to follow up with a moisturizer or else my face wouldn't feel completely nourished. While the toner did give a brightness to my skin and really made my skin tone more even, I only dislike how I felt I had to follow up with another product to restore the moisture back to my skin. The Purifying Youth Serum was probably one of my favorite products out all the ones I received. While I was using different toners, this one had more of a liquid texture and wasn't as heavy as other serumes. Just one pump was enough to sooth my skin, with me focusing more on the center of my face and my forehead. I loved how it made my skin feel so good overall and I really felt like I didn't have to put a moisturizer on afterwards. While I wish I had a Derma E moisturizer to fully complete my routine, I didn't so I stook to my Purlisse moisturizer after using this product which proved to be a great combination to wake up with a moisturized and youthful looking face. This was an interesting product to me because it says that it's a peel, however it's a product that you use overnight and you wash off in the morning. It's claimed to exfoliate your face while also bringing a new texture back to your skin. The overnight peel has fruit acids and glycolic sugar cane. Which basically removes your dead skin cells from your face overnight. It's meant to enhance the radiance of your skin while also evening out the pigmentation. Boy did I see a difference in my face after this using this product. I like to use it when my face is feeling dull and blah and it's like it suddenly brings me back life. I feel like Bella when her body is transforming into a vampire. Not the burning feeling inside, but you know the part in the movie where she's just laying there and it's like she's coming back to life looking so much more beautiful than before. It's like I did my skin care routine 10x in a row and my face felt like a baby's bum but looked like the sun and everything was blinded by it's brightness. Although it does make me look like I'm sweating 1000 bullets when you first apply it ... and for the next few hours or so. This was a really great product and I was certainly impressed by it. This was a very interesting product that I tried because it was unlike any other makeup remover that I tried before. Instead of it being more of a liquid, it had a thicker and more gel like consistency to it. It was also very soothing to the skin and when you use it, it feels like you're putting a hydrating face mask on. This product is fragrance and oil free to give you the most benefits when using it. However, you do have to follow up with a makeup mask to take any extra makeup off, that's the only thing that was disappointing. However, the makeup remover penetrates deep to take majority of your makeup off. This product has become my staple product to use in the morning. It feels so good on the skin, almost like it's waking it up. If you store it in a dark, cool place, it will also feel soothing to the skin even more when I use it. I like to wash my face in the morning when I shower, so the extra steam opens up my pore to also the cleanser to work well on my skin. It makes me feel so refreshed and doesn't leave a firm feeling like some other cleansers I've used which is a plus. You really only need a little squeeze to wash your whole face and I also like to bring this down to my neck as well. It has become one of my favorite cleansers to use. I tried this mask bcfore but it was only a sample size so I was really excited to get a nice sized bottle of this charcoal mask. It's one of my favorite masks becasue you can put it on and it will dry within 5-10 minutes and it doesn't dry up too much on your face making it feel stiff. this mask does dry up but it's as if its pulling up all of your impurities in your skin and it makes your face feel so good when you take it off. I really enjoyed this mask because I felt as if it brought all the dirt out of my face without drying it out. It was a nice product to use on your skin once or twice a week if your prefer. I like using this on days when I want to relax myself and just feel good overall. A day where I refresh my body and that is like a Sunday or a Saturday. This detox scrub has also become one of my favorites. When I really want to deep cleanse my skin after wearing a lot of makeup throughout the week, I like to grab this srub to use on my face. It has a metallic and almost body wash texture to it with beads throughout the really scrub your skin. This product also contains active charcoal to really get the dirt off your face. It has a ton of minerals and great toxin fighting ingredients to refresh your face after prolonged makeup use. I highly recommend this product if you're someone who likes to wear makeup almost on the daily. Using this product twice a week will help to keep your face look and feeling fresh. 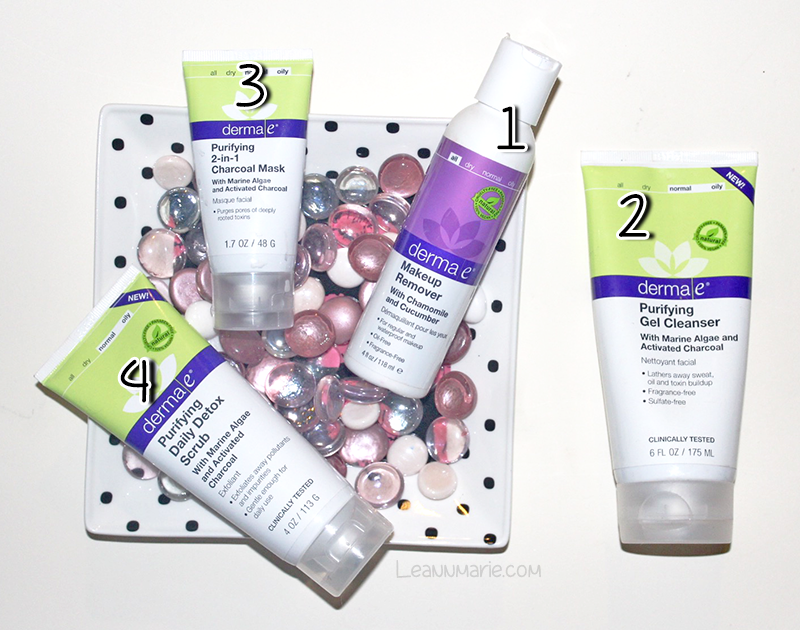 Overall, I really enjoyed Derma E products. They were really great to use and I still use them even now. I received this package almost two months ago and I've been using these particular products for a little over a month. I developed a new skin care routine that works for me and is gentle enough for my face while keeping it nourished, radiant, and healty. I highly recommend Derma E if you're looking for an effective vegan and cruelty free skin care routine because there are a variety of products to choose from to cater to your skin type. Have you tried Derma E before? Let me know in the comments down below.